Who Needs an iPhone 3G S with These 8 Great Alternatives? 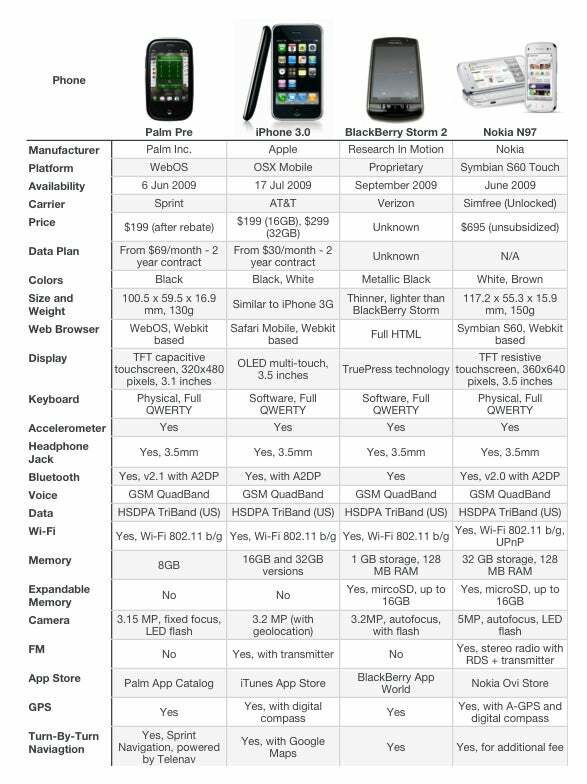 In the next few months four smartphones are going to battle it out. The Palm Pre, the iPhone 3.0, the BlackBerry Storm 2 and the Nokia N97 are all going for the crown title this summer. But which one should you choose? While not all of these four smartphones have been officially announced, rumors have been flying around for weeks anticipating the new Apple iPhone and the second iteration of the BlackBerry Storm. And there are enough leaks out there to put head to head some preliminary specs. I'm not going to run you through all the features of these phones, you can check that in this specs table I put together. However, there are a few interesting issues that I'm going to mention. The latest rumor on Apple's new iPhone hardware says the device will cost $199 for the 16GB version, while the Palm Pre will cost the same (after rebate), but only for a 8GB version. Even more, the Pre will go on sale a merely two days before the new iPhone gets announced, trying to steal some of the iPhone hype. As for the speculation that the new iPhone would have rubber corners -- forget it. It is highly unlikely Apple would sacrifice slickness for ruggedness. On the other hand, some sort of a non-slip back panel is more plausible. Most of the Blackberry Storm 2 rumors point that the device would come with a 5-megapixel camera, but all the recent leaked pictures of the device depict it only with a 3.2-megapixel camera. Some say the Storm 2 could come out as early as next month, but RIM would most certainly leave 12 months before upgrading the current model. The Nokia N97 is one of the hidden gems out these four smartphones. Though it packs the highest price (as it's not subsidized by any carrier), the N97 comes with some of the highest specs, including the best camera out of the lot.